After World War II, Meyerbeer’s operas did not regain the popularity they had enjoyed before the 1930s. In the post-war period, ‘Grand opéra’ was deemed dated, excessively long and too costly. 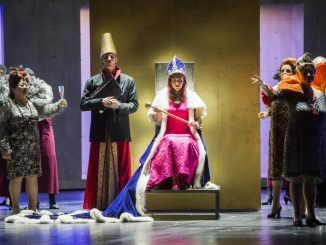 Only recently have staged productions of ‘grands opéras’ started to pop up again here and there, most notably at The Deutsche Oper Berlin, where an entire ‘Meyerbeer cycle’ is in the making. In Essen, the Aalto Theater contributes to the ‘Meyerbeer Renaissance’ by mounting a production of Le Prophète, which premiered on April 9. After their fruitful collaboration on Les Huguenots, the librettist Eugène Scribe proposed to join forces again for another opera dealing with the Reformation. He suggested a plot based on the historical revolt of the Westphalian Anabaptists, who were led by Johan Beukelszoon (more commonly known as Jan van Leiden). This Jan van Leiden, originally from the Dutch town of Leiden, became an influential prophet and a leader of the Münster Rebellion. He turned the city of Münster into a millenarian Anabaptist polygamous theocracy, and proclaimed himself “King of Münster” in 1534. In 1535, his insurrection was suppressed after a siege of the fortified city. Jan van Leiden was captured and executed along with two of his fellow Anabaptists after a period of excessive torture. Their bodies were placed in three iron cages and hung from the steeple of St. Lambert’s Church, where they were left to rot. About fifty years later, the bones were removed, but the cages still remain today. Scribe’s libretto deals with the rise and fall of this prophet, Jean de Leyde (in French), although the story is only loosely based on history. The story is altered to suit dramatic purposes, such as the addition of Jean’s mother Fidès and fiancée Berthe. 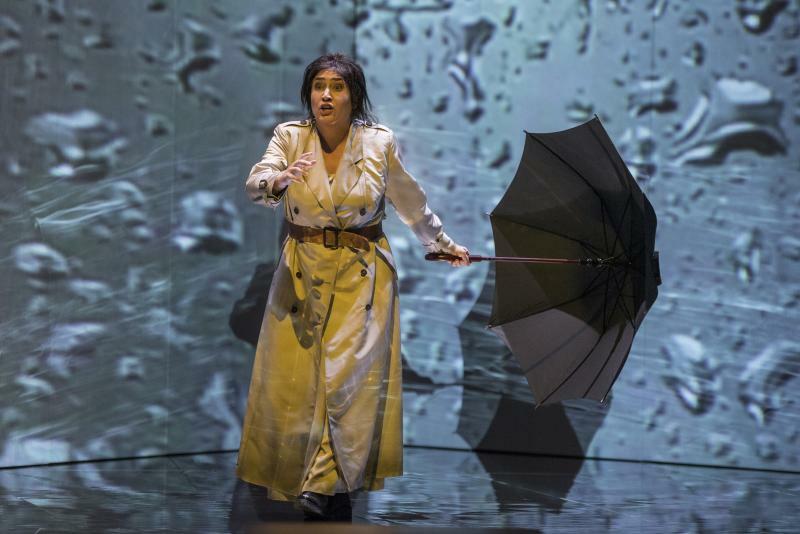 At the centre of the opera stands Jean, a rather ambiguous character throughout: it’s never completely clear whether he is a conscious charlatan or a weak-willed character who has been led to believe in his own mythos. Is he driven by genuine idealism or a desire for personal revenge? At any rate, the opera starts with Jean’s mother picking up her future daughter-in-law from Dordrecht for her wedding. Berthe reveals that she is a serf, and the two ask the Count of Oberthal for his permission for the marriage. Oberthal, however, decides to keep Berthe for himself and takes the two women captive. The second act is set in Leiden, where Jean is an innkeeper. He is spotted by a trio of Anabaptists – an unholy Trinity of sorts – who notice his resemblance to a painting of King David in the Cathedral of Münster. Seeing the powerful political and religious potential of this resemblance, they invite him to join them. Initially, Jean refuses. Then, Berthe, having escaped, enters the inn, trying to hide from her pursuer. Soon after, Oberthal enters and tells Jean that he will lose his mother if he does not give up Berthe to him. After brief hesitation (which lasts just seven bars), Jean decides to return Berthe to Oberthal in exchange for his mother. After his mother has fallen asleep, a distraught Jean decides to join the Anabaptists. In the third act, Jean’s fellow Anabaptists decide to charge on Münster without informing Jean, who has become the sect’s prophet and leader. When the charge ends badly, the people turn against Jean. When Jean hears that Berthe might be in Münster, however, he wants to take the city and manages to inspire and incite his followers. The fourth act takes place in the city of Münster itself, where a destitute Fidès and Berthe meet each other again. Both believe that the messianic prophet, who is about to be crowned king in the Cathedral, is responsible for Jean’s disappearance and death. Berthe decides to avenge Jean by killing the prophet. Fidès heads into the Cathedral for the prophet’s coronation and discovers that it is her own son. When she publicly recognizes him, Jean denies having a mother. He eventually gets his mother to rescind her claim, and his followers marvel over his ability to heal the mentally ill. The fifth act also takes place in Münster. The city is under siege, and things are looking bad. Jean’s fellow Anabaptists have betrayed him and have struck a deal with Oberthal, who has secretly entered the city. Jean visits his mother in a cell and asks for her forgiveness. The two then encounter Berthe, who is setting up explosives to kill the prophet, and they decide to leave the city together. But when Berthe discovers that Jean and the prophet are one and the same, she commits suicide. Jean then decides to finish her work and blow up everyone in the city, including himself and his mother. The vocal parts of this melodrama put rather high demands on the singers. Meyerbeer wrote his music with specific singers’ voices and extraordinary capabilities in mind. 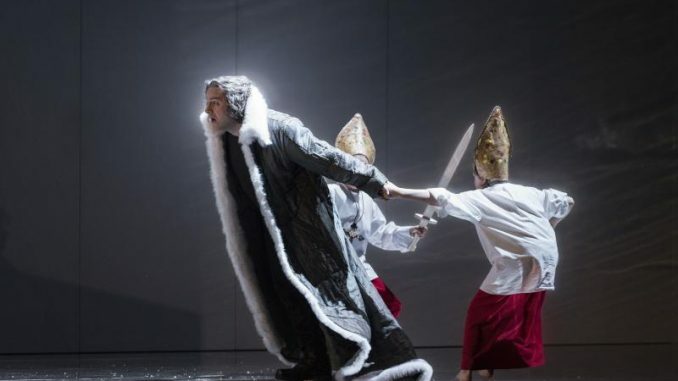 The role of Jean, for instance, requires an agile lyric-heroic tenor voice with massive amounts of vocal stamina, which John Osborn more than delivered. He sounded fresh-voiced throughout and all the vocal fireworks seemed to come completely effortlessly. I can’t think of any other singer better suited to this role today. The equally large role of Fidès requires a mezzo-soprano/alto with a wide range and a lot of vocal power. Marianne Cornetti, costumed as a somewhat suffocating but homely matron, sounded wonderfully warm throughout, and her voice seemed able to meet the role’s high demands tirelessly. As Berthe, Lynette Tapia also impressed. Her voice is a bit smaller than those of her colleagues on stage, but she more than makes up for it in sheer vocal agility. Her coloratura runs, her trills and high notes are all impeccable, and her sound retains a certain warm quality throughout her range. 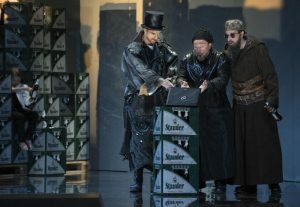 As the Unholy Trinity of Anabaptists, Albrecht Kludszuweit (Jonas), Pierre Doyen (Mathisen) and Tijl Faveyts (Zacharie) also delivered impressive, solid performances, while Giuliano Carella lead his orchestral forces in the pit with great energy and flexibility. Carella accommodated the singers whenever necessary by holding his orchestral forces back just a little, thereby ensuring that everyone involved was able to deliver with maximum impact. The production, by director Vincent Boussard, is relatively minimalistic. 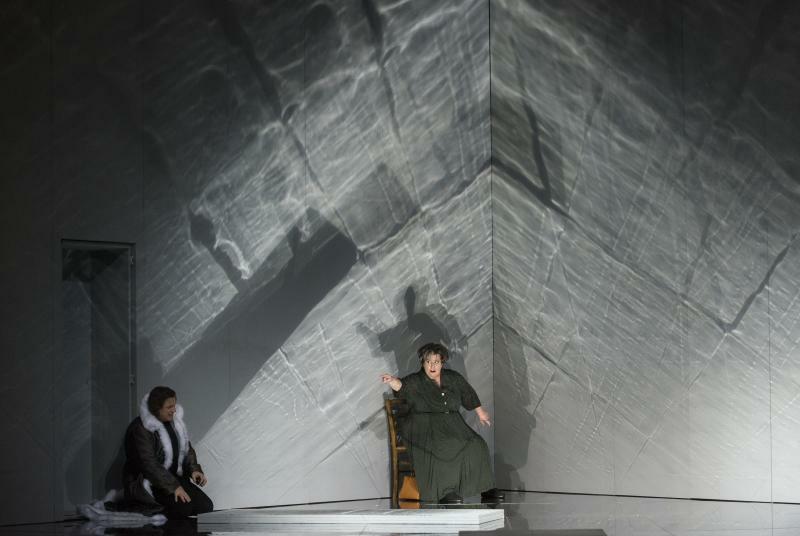 The somewhat sombre set consists of two grey walls to either side of the stage and a rotating platform in the middle, which allows for swift and fluid scene changes. On the walls, images that add to the overall atmosphere are projected, such as raindrops. Everyone on stage is dressed in modern or timeless costumes, but Boussard tells the story straightforwardly. His staging also includes some very effective details, which provide the audience with additional insight into the characters. Upon his first appearance on stage, for example, Jean is seen playing guitar and pretending to be a rock star, all alone in his room. When he incites his followers in the third act, his handling of a crucifix rather resembles his handling of his guitar earlier. Jean is also living a long-existing dream of celebrity and stardom, not just a personal revenge fantasy , Boussard reminds us at this moment. Another interesting find on part of Boussard is the addition of a large safe, around which the three Anabaptists repeatedly circle, and which they empty whenever they fear that their luck might change. This illustrates the trio´s motivation rather nicely, while Jean, on the other hand, seems much more interested in fame and celebrity than material wealth. tists are featured here, and their eventual doom foreshadowed, but what it signifies precisely remains unclear. 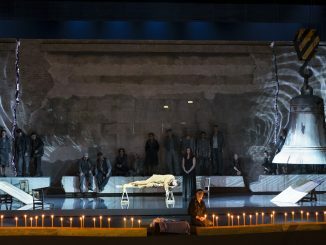 All in all, however, Boussard’s production provides the icing on the cake of a unique operatic experience of extraordinary quality. Warmly recommended to all lovers of opera.